Empty nests aren’t what they used to be. 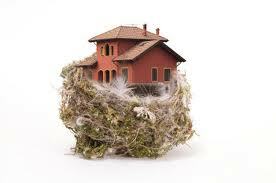 In fact you might be hard pressed to find a nest with vacancies. This isn’t exactly news; we’ve been hearing about dismal job markets and diminished economic opportunities for young adults for quite some time now. It’s commonplace to hear of households that include adult children (and even their children.) What is rarely mentioned in these discussions is that it is often quite an agreeable arrangement. Modern parents and children (of all ages except perhaps peak adolescence) enjoy spending time together. Something has happened in recent decades to blur the lines between the generations. The most intriguing aspect to the change is that it’s both the younger and older moving towards each other. If we were to jump in a jeep with our binoculars and pursue the average American nuclear family in their natural habitat, we would spot this morphing phenomenon. Parents and children (of all ages) look an awful lot alike. They dress alike, they groom alike, they text alike. The fact that this happens in public proves that everyone is okay with it. Daughters don’t mind (or perhaps even enjoy) their mothers appropriating their dark/cadaver like nail colors, sons enjoy/tolerate sharing their baseball caps with their fathers. From the back (if weight wasn’t a factor) you’d be hard pressed to determine which generation was which. It’s been a long time since we’ve witnessed a unified family look, in nature that is; it happens in Christmas cards all the time. Surely there’s a more recent example of this indistinguishable appearance; but it is Little House On The Prairie that comes to my mind. If we were to hop out of the jeep and (lawfully) enter homes, we might discover that there is no “adult” space (formally known as the living room) and “child” space but instead “family” space. Unless a parent engages in a delicate or dangerous activity, there is probably no “off-limits” space within the home (for fun, check to see if there’s a lock on the parents’ bedroom.) The music, movies, social media, gadgets, and fitness regimes are most likely shared. This average family probably socializes together and often vacations together. They will attend all school and family events as a unit as well. To the novice jeep rider this may appear novel. But it is actually a very old phenomenon (see Little House reference.) Back when we were forging new territory and had little if any connections to the world, our nuclear family was our world. One’s fortunes and survival depended on the strength of the nuclear family. It is slightly ironic that in an age of such instant and ubiquitous connectivity we revert back to an isolationist mode of living. But if we take a closer look (back in the jeep everyone) we will see that we are anything but connected to the larger world. When is the last time you had friends over for dinner? How often are you invited over for drinks? When was your last block party, potluck or open house? How many times a week, or even month, do you go out with friends (without children in tow?) How long have you been at your current job? Do you lunch or happy hour with your co-workers? How often do you attend religious or community events? Can you recall the last time you dropped by a friend’s home unannounced?